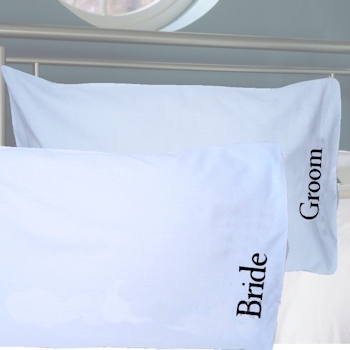 Luxurious embroidered or monogrammed 100% Egyptian Cotton pillowcases. Luxurious embroidered or monogrammed 100% Egyptian Cotton pillowcases. Superior quality percale pillowcases made from all natural cotton 200 Thread Count fabric or your choice of 400 Thread Count fabric. Embroidered with personalised name or initials on each. These quality embroidered pillow cases are machine washable and ironable which provides a far better lasting finish than with the printed versions available elsewhere. The pillowcase measures 50x76cm housewife style. Please select from a White or Cream coloured pair. Embroidery is positioned along the opening side of the pillowcase so that this gift can be comfortably slept on making a unique yet useful gift! Please allow approx 48 hours for dispatch as these are made to order.